Here's a list of bitcoin sportsbooks that I think are currently the best. This is a list of bitcoin-only sportsbooks. 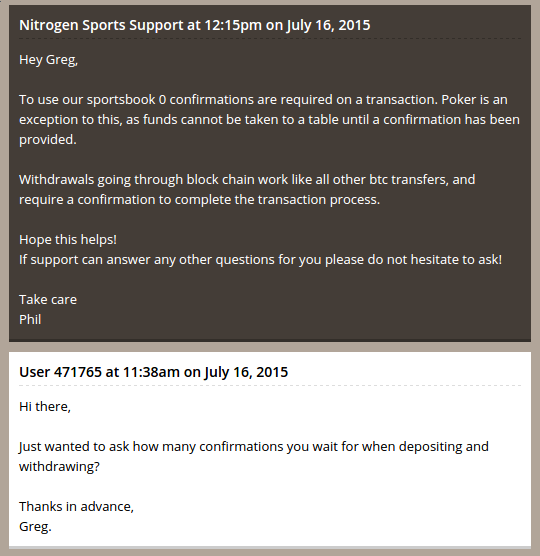 There are other traditional sportsbooks that accept bitcoin as a deposit method (e.g. Bookmaker), but the sportsbooks in this table use bitcoin exclusively. How have I rated these sportsbooks? The sportsbooks in the table above are my favourite places to bet, based on my experiences of betting online with bitcoin. Now, I haven't bet at every bitcoin sportsbook on the Internet, so there may be a few other decent sportsbooks out there that I'm missing out. However, these are the ones that caught my eye and have been a pleasure so far. I haven't rated these sportsbooks based on their odds, or the range of sports you can bet on. I'm not a massive sports-bettor, so I don't scour the Internet for marginally better odds when I'm planning on making a bet. For me, the difference in the odds between different sportsbooks tends to be negligible, so I haven't taken this in to account when ranking these sportsbooks. So if getting the absolute-best-odds-possible is essential to you, try an odds comparison site instead. Furthermore, I tend to bet only on the more popular sports, so I haven't rated these sportsbooks on the breadth of sports (or the variety of betting options they offer). So if you've got a hot tip on a big upcomming Water Polo game, these bitcoin sportsbooks may not cut the mustard. Why bet at a bitcoin sportsbook over a traditional sportsbook? Bitcoin is to traditional money is what email is to the traditional letter. You can still send a letter in the post, but email is quicker because it's digital and requires less processing. The same thing applies to bitcoin: it's digital money that isn't bogged-down by old-fashion payment processing methods. So not only does this mean faster deposits and withdrawals, it also means that bitcoin sportsbooks are freed up to focus on what they're good at, like making better websites and being more helpful with support. Some traditional sportsbook are wonderful (e.g. Bookmaker), but they cannot escape the drudgery that is the archaic (and costly) processing of fiat currency. Traditional sportsbooks require whole divisions to take care of deposits and withdrawals, and these cost both time and money, which is ultimately reflected in your experience of their website. Bitcoin sportsbooks, on the other hand, have the luxury of having a secure and reliable cashier that is essentially automated... all thanks to bitcoin. All deposits and withdrawals are handled by the blockchain. Better odds, as sportsbooks have less payment processing expenses. Better support, as their time is not consumed by the worries of payment processing. Better websites, because again, their time is freed up to focus on what they're good at. Bitcoin isn't a novelty. It's a genuine improvement to the way we've made transactions on the Internet, and these improvements are being highlighted in this new wave of bitcoin-only sportsbooks. Honestly, after you've made your first bet at a bitcoin sportsbook, I'd be suprised if you ever went back. My friend Thomas has a lovely website called Picks.org (sportsbook reviews and betting strategy). I can't write a page about sportsbetting without giving him a link.